*The box and owner's manual incorrectly state the gun is nickel-plated. In fact, it's really plated with chrome. 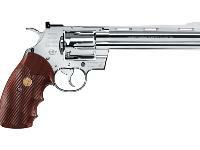 You loved the Colt Python that came out earlier, and now it's available with a chrome finish and faux wood grips. No matter how it's finished, the Colt Python is one of the most desired firearm revolvers, and now you have your choice of finish in a CO2 BB gun. When you pick it up, you'll swear you're holding the authentic firearm. The working ejector rod, the use of cartridge shells, the full barrel underlug, and swing-out cylinder really bring this air gun to life. Gun writer,s and firearm historians describe the Colt Python as the "Rolls Royce of Colt Revolvers" and "the best revolver in the world." If they held the CO2 version of this famous revolver, they'd probably describe it the same way. The Colt Python CO2 BB revolver is compatible with Dan Wesson BB revolver shells, however you'll notice a drop in velocity due to the smaller size of the Dan Wesson shells. Things I liked: The item is like described on the site: very realistic and nice finishing. The shipping was made fast and the product arrived quickly. I recommend it! Things I liked: I received this gun today and my first impression was that it is a strikingly beauty. But as I took it out and handled it, the faults started to be apparent. the fit and finish is merely good, the Colt box is a nice touch but the gun itself just feels kind of cheap when compared with my Dan Wesson 715 in chrome. The Dan Wesson looks and feels like a real gun but when you pick this Colt up and hold it, the first thing you notice is the cheap plastic grips and the just OK finish. 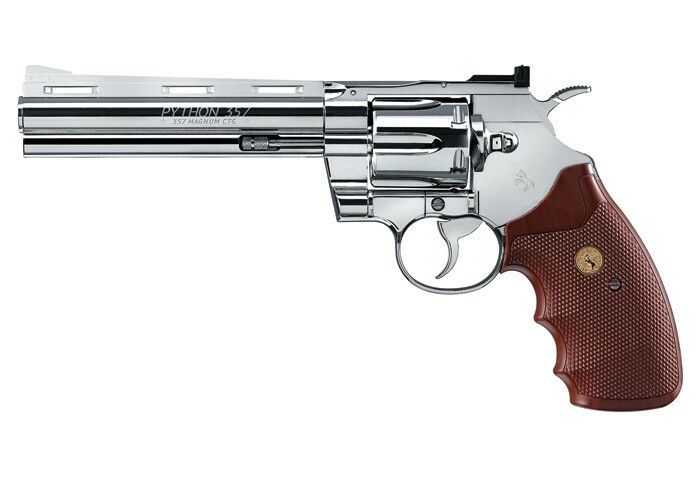 This was more $ than the Wesson and just goes to show how great of a value the Dan Wesson is. Things I would have changed: THE GRIPS OBVIOUSLY, better quality control as far as the finish goes. Also the cylinder hits the gun frame as you close it. Lastly there is a slight wobble of the cylinder when it's closed and ready to shoot. (The wobble was mentioned in other reviews so it's a known issue with these). What others should know: It's a nice gun and I like it but I don't love it. If I knew what I was going to find out with this piece, I would have purchased something else. 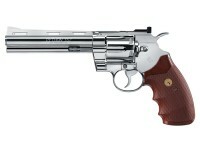 Maybe a 2nd Dan Wesson in 4". Things I liked: The similarity with a real revolver. How/where may I purchase a replacement threaded cap for the C02 cartridge ? Give Umarex USA a call. Hi... 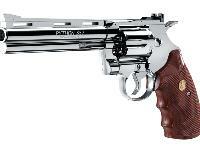 This is a very beatifull gun, I love it I want to buy right now, I'm from Peru, Can you ship this gun to my country ?please.